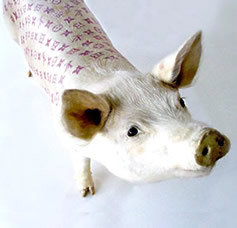 The controversial 'Art Farm' created by Belgian artist Wim Delvoye rears pigs specifically as art objects. 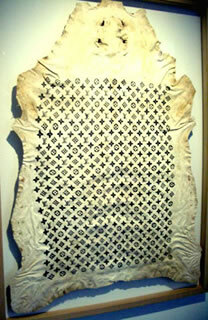 Tattooed with elaborate designs such as the Louis Vuitton insignia shown here, Delvoye's project invokes the custom of branding livestock with identifying marks, a practice which led to the modern use of the term 'brand' in marketing. Graphically combining these two meanings, Delvoye forces us to confront the fact that the animal is purely a commodity, its skin often destined for use in luxury accessories, or in this case, as an artwork for galleries and collectors. In a further act of brand appropriation, the artist's 'signature' is based on one of the world's most recognizable trademarks - the Walt Disney logo. Often added to the tattooed designs, the fact that the sentimental, Disney-esque depiction of animals is far removed from the realities of Delvoye's Art Farm provides a final touch of grim humour to what is already a disturbingly blunt representation of art as commerce. This work is one of an early series addressing the power of lifestyle brands and their ability to seduce consumers through literally nothing more substantial than image alone. 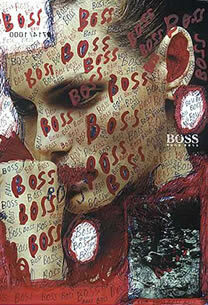 Working directly onto magazine advertisements for companies such as Hugo Boss or Calvin Klein, Hirschhorn's interventions are frantic and aggressive, defacing the images with his own powerful marks. Photographic collage is also used to depict the realities of other global lifestyles: violence, repression, hunger. Here, the endless repetition of the word 'Boss' serves to overwhelm and undermine the implied exclusivity of the original logo, which remains visible. With this act, however, Hirschhorn also stakes a claim for his own authorship, subjugating the original advertisement to a new aesthetic and meaning of which he is now indisputably boss. The series of wooden sculptures supposedly from the Chapman Family's private collection are meticulously constructed to resemble traditional tribal carving. In line with their fictitious origin, the Brothers claim they were amassed over a period of 70 years. All the works incorporate familiar motifs sourced from the fast-food giant McDonalds, an obvious comment on the brand's ubiquity and global reach. Yet the fact that marketing icons replace symbols traditionally derived from religion or myth provides 'evidence' of an even more disturbing phenomenon: the ability of consumerism to permeate cultures or even usurp them completely. 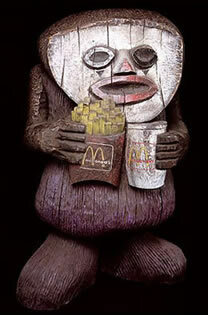 Mirroring the documented impact of imperialism on indigenous art forms, the Chapman Family Collection presents McDonalds - and by extension, all mega-corporations - as a global consumerist empire whose pervasive effects are all too clearly evident. 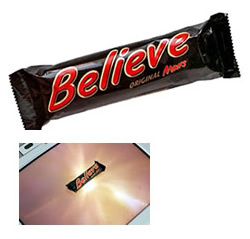 Believe, by UK artist Jack Strange, consists of a (genuine) chocolate bar placed on an upturned TV set. The screen displays a loop of swirling visuals; unpolished, slightly cheesy, their presence seems to underline the ridiculous, even disturbing, nature of a morally significant imperative like 'Believe' applied to candy. In an entirely different reading, however, the psychedelic swirl becomes a cinematic metaphor for altered states of mind. Reminding the viewer of the power of branding to manipulate perception, the possibility arises that a chocolate bar may indeed be capable of inspiring belief of some kind. One thing is certain, however. The chocolate is a self-styled 'limited edition' adopting the tactics of art to enhance its perceived value. By placing this chocolate bar/artwork at the center of his own chocolate bar art, Strange parodies a dubious marketing strategy with perfect irony. 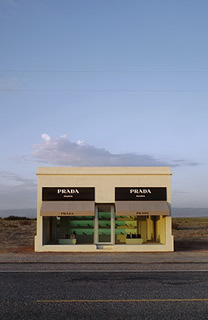 The so-called 'Prada Marfa' stands in otherwise desolate ranching land on US Highway 90, near Marfa, Texas. "(driving) toward the artwork it will appear to be a large minimalist sculpture, as one gets closer it will look like a luxury boutique where a display of Fall 2005 high-heel Prada shoes and bags will be seen through the store front windows.... "
Despite the deadpan description, the experience is clearly unusual, even oddly comic, with eventual recognition of the unexpected 'Prada boutique' pivotal to its highly surreal nature. Furthermore, while many have criticized the project as a cynical marketing ploy, the artists' apparently neutral stance almost certainly veils an underlying criticism of lifestyle branding and its impact on today's consumer. If a real store were to exist in a similarly deserted roadside location, it would almost certainly trade in absolute necessities: gasoline, food, water. But here, Prada shoes and bags become the essential items, commodities so important that a boutique in the middle of nowhere is needed to supply them.